Who doesn’t want to add a little color to their jewelry, or maybe your own patterns and images? This class focuses on my technique for drawing on metal with colored pencils. Learn to add color and excitement to your work with my special technique. In this 4 day class you should finish at least one pendant and several sample pieces. Fabrication techniques will be covered as time allows. All levels welcome. Register Here. This workshop is full. There is a waiting list. Why not add a little color to your jewelry along with your own patterns and images and take your inspiration from the tropical beauty of Puerto Vallarta? This class focuses on my technique for Drawing on Metal with colored pencils. Learn to add color and excitement to your work with my special technique. In this 5 day class you should finish several pieces. Fabrication techniques will be covered as time allows. All levels welcome. Because we will be in beautiful Puerto Vallarta we will be taking time to enjoy the weather and soak in the local art and culture. You’ll probably want a dip in the pool after lunch. There will be plenty of time in the open air studio but we won’t skimp on the fun and relaxation. Hacienda Mosaico is a spectacular place to create, surrounded by fabulous mosaics, lush garden, and exciting artwork. Registration will include lodging, breakfast and lunch and I can tell you that the food is incredible. Dinner is on your own and within a couple of blocks you can find anything from super cheap tacos to moderately priced fine dining. There is no better place to relax and focus on your creative work. The commute from class room to pool and dining area. Another delicious treat prepared by the talented chef. Learn to apply a proper pin finding, successfully solder a commercial pin finding, use surface design to transform simple techniques into fabulous pin/pendants by combining techniques and materials. Emphasis on finishing and surface development. A fabrication workshop. This workshop will not include color. Who doesn’t want to add a little color to their jewelry, or maybe your own patterns and images? Class will cover Deb's technique for applying color to copper with colored pencils, design and drawing tips, and some fabrication based on time available. Learn to add color and excitement to your work with her special technique! In this 5 day class you should finish at least one pendant and several sample pieces. All levels welcome. Who doesn’t want to add a little color to their jewelry, or maybe your own patterns and images? This class focuses on my technique for drawing on metal with colored pencils. Learn to add color and excitement to your work with my special technique. In this 5 day class you should finish at least one pendant and several sample pieces. Fabrication techniques will be covered as time allows. All levels welcome. This 2 day workshop is the perfect place to tune up your jewelry fabrication skills. We will work on soldering and riveting as well as sawing, filing, and finishing. It's a great way to prepare for the Drawing on Metal class, whether you are experienced or not. Register at Mendocino Art Center. This class focuses on my technique for drawing on metal with colored pencils. Learn to add color and excitement to your work with this special technique! 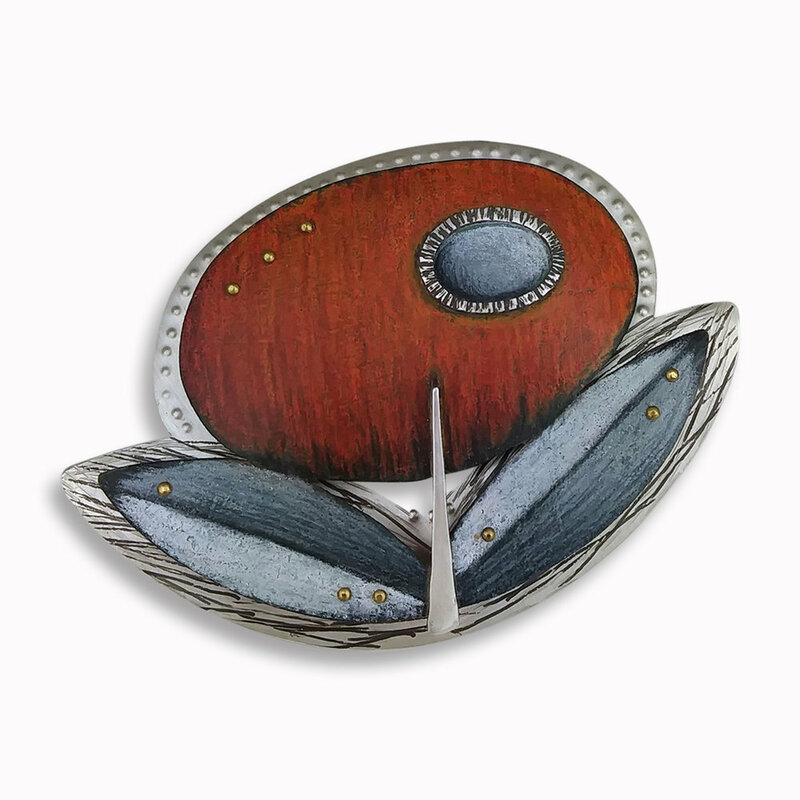 I will discuss color pattern and texture, as well as how to incorporate this technique into a pendant. Design your own or use my simple pattern to get started. Students will work on design and finishing as well. Students will focus on Deb's special technique for drawing on metal with colored pencils, while learning how to add color and excitement to your work. Drawing on Metal goes Tropical! Join me in Puerto Vallarta.